TEach Mayan city-state had a ruler of its own who had the traditional privileges of a King or an Emperor. The right to rule was hereditary and was passed down from one generation to the next. The ruler was typically associated with religious authority and divine sanction as well. As a result, he was closely allied with the priestly classes and directly overlooked major religious ceremonies. Most of the monumental architecture built by the Mayans was ordered by the Mayan rulers. When a new dynasty rose to power, it typically legitimised its ascent to throne by having a large pyramid-temple built in the city. Each Mayan city-state had a ruler of its own who had the traditional privileges of a King or an Emperor. Mayan rulers claimed to be divinely sanctioned to rule over their people. This divine sanction was derived from their close association with religious activities and rituals. Many early members of the major Mayan dynasties were directly involved with carrying out such rituals and it was only later that they relegated most of these tasks to the priestly class. In some Mayan cities, it was a religious obligation for the rulers to overlook some religious ceremonies and fast during a certain time of the year. Rulers were considered not just the political heads but also the religious heads of the society. Since major Mayan cities were frequently engaged in warfare, either to expand their dominion or to defend their city against other expanding city-states, they needed strong rulers who were accomplished military warriors. Even though the rule was dynastic, every new ruler was expected to be a skilled warrior and a seasoned military leader. Typically, if a Mayan king failed to prove successful militarily, he lost the support of the public. Many extant Mayan carvings show different rulers dressed up in military attire as if ready to march to the war. In the Mayan society, each social classes dressed in such a way as to distinguish it from others, so that its dress also spelled the social status. For instance, the commoners were legally bound to dress differently from the nobility and royalty dressed differently from all other classes. Mayan rulers typically wore loincloths and a cape around their shoulders. At special occasions such as ceremonies, the rulers wore elaborate and beautifully-feathered headdresses. Adornments typically used on dresses were feathers, and different kinds of jewelry was born on the arms, wrists and in ears. A coronation ceremony was critically important in beginning the rule of a new Mayan king. Given that the ruler was required to have religious authority on his side, a coronation ceremony affirmed that he had the divine sanction. The ceremony typically comprised of the new ruler sitting down on a pillow covered with jaguar pelt. After having seated him on the pillow, the high priest would then place an elaborate headdress on his head. This ceremonial headdress came decorated with different items such as seashells and obsidian artefacts. The ceremony was typically also accompanied by celebrations and festivities. Since Mayans believed in certain aspects of ancestor worship, the commoners buried their ancestors inside their own houses, right under the floor. This was done with the hope that the deceased ancestor would remain aware of the family and would look out for them in the heavenly realm. The burial practises were different for Mayan rulers. Rulers typically had elaborate tombs built for them inside one of the major temples. Upon their death, they were then placed in the tomb together with a goodly amount of maize, jade and different gifts which the ruler might need on his way through the underworld. 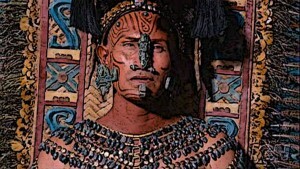 Mayan Ruler Yax K’uk Mo’ was the first ruler of the city of Copan. His name translates to “First Quetzal Macaw”. He was born in Tikal but eventually came to Copan when it was just a town. After taking over the control of the town, he established himself as the ruler and dedicated himself to improving the commerce of the place. In no time, he had been successful in establishing Copan as a successful city and left an enduring legacy so that the city rose to one of the most powerful Mayan centres in later years and his dynasty ruled over it for many centuries. One of the most notable rulers, as depicted in extant Mayan sources, is titled 18 Rabbit. The real name of the ruler is unknown but became the crowned king of the Copan city sometime in the 7th century. 18 Rabbit wasn’t the eldest son of the previous ruler but he still managed to ascend to the throne because of his exceptional intelligence and wisdom. According to Mayan sources, he travelled to different Mayan lands and when he returned to his city, he soon assumed the role of the ruler. He was later immortalised by the Mayans in the shape of elaborate statues depicting him. In most cases, Mayan rulers enjoyed absolute authority in political, military, economic and social matters. They usually monopolised key resources such as trade routes and this helped them consolidate their power. Some Mayan cities also had powerful councils of noblemen who accompanied the King. These councils had considerable power and influence, so the ruler was usually persuaded to listen to them. Religious authority was critically important to the rulers and they maintained their public image of being the divinely sanctioned ruler by offering public sacrifices in elaborate rituals. Mayan civilisation comprised of different city-states, each of them with a different ruler of its own. The rule of a city was dynastic and in the ruler were vested military and religious authorities. Religious authority and divine sanction was considered very important for a Mayan ruler. He was also expected to be a skilled warrior since Mayans often had to wage war, in order to expand or defend their realms. Politically, a Mayan ruler had absolute power, although in some cases he shared it with a council of noblemen who served as advisers to the King.